Native tree and shrub planting were completed on the project site to increase biodiversity of the riparian zone and add habitat. Planted between the Good Samaritan Parking lot and Paradise Creek these planting will help filter runoff from the cars in the lot. The Good Samaritan Village landscaped the project site. To the north is a large impervious parking lot at an elevation approximately 3 ft above the project site, thus the project site receives runoff associated with cars in the parking lot. There are two drainage paths running from North to South in the project area which support turf grass but are wet much of the year. Immediately West of the project area are several 50 year old conifers and a manicured hedge which shield the project from Eisenhower road. Paradise Path lies to the south between the project area and Paradise Creek. The path is heavily used by residents of Good Samaritan village for walking, and neighborhood residents for walking, running, skating or bicycling to Mountain View Park. The project area is primarily covered with turf grass expect for 5 or 6 4 ft tall Quaking Aspen planted by the Good Samaritan Grounds crew. Lawn Before Project: This lawn is bisected by a storm water flow that originates on the building roof and ends in Paradise Creek, carrying any contaminants picked up along the way. 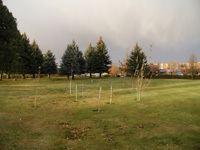 Trees were planted into this wet area to help take up nutrients.